This piece of bib necklace is made of glass pearl beads, imitated pearl acrylic beads and handmade glass faceted bicone beads.It is very suitable to wear on many kinds of occasions. The white wedding crown is made of pearl and crystal for bridesmaid, this tutorial will show u the simple way to make the pearl crown. Hope u will like and enjoy the process. 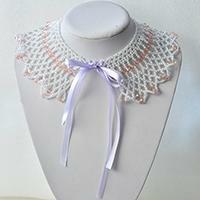 Need a pretty necklace for wedding? 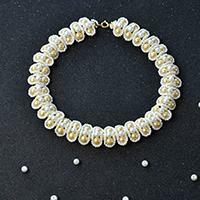 Now you can see today’s Pandahall tutorial on how to make pretty pearl beaded chain necklace for wedding. 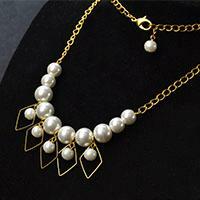 Searching for pearl necklace designs? Look here! Today we’d like to share you a very exquisite pearl bead flower pendant necklace, I bet you’ll like the design. 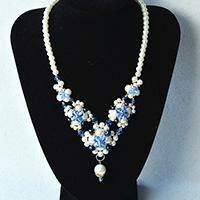 Do you want to make this fashion pearl necklace at home? Follow this detailed tutorial and you will figure out how to make it. 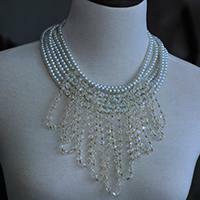 Are you looking for a beautiful, dreamy pearl necklace for wedding? 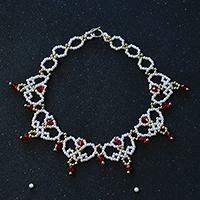 Here, I want to share with you this elegant pearl bead choker necklace made of white pearl beads and red faceted beads. Wanna make some wedding hair pins? 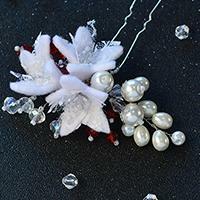 In this article, you can see how to make handmade wedding hair pins with pearl beads and glass beads decorated. Wanna DIY wedding bridal flower bouquet? 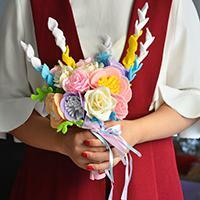 In this Pandahall original DIY project, you can learn how to make a colorful felt and ribbon wedding bridal flower bouquet. Have you ever DIY any wedding accessories? Today I’d like to show you how to make a wedding headband at home. I bet you’ll like the beautiful design! 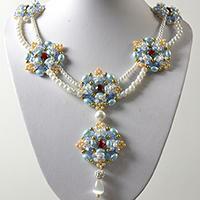 Are you seeking for inspirations on handmade necklace for wedding? If yes, I really hope that my diy bead weaving choker necklace for wedding could help. 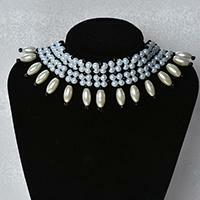 Are you interested in pearl beads necklace? If yes, today’s Pandahall tutorial on how to make bib pearl beads necklace for girls really worthy of your attention! Do you have a friend who is a bride-to-be? 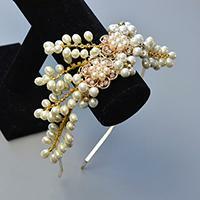 Are you searching for pearl jewelry for wedding? 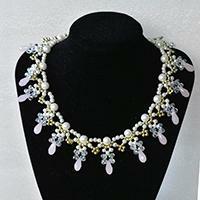 Check this elegant white pearl flower statement necklace here, it won't let you down. Beading Bracelets are always fashionable! 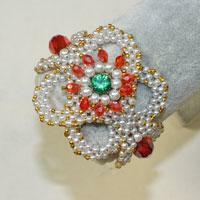 Today, I will share you a Pandahall tutorial on how to make simple beading flower bracelets with pearl and glass beads. Wanna make necklace for wedding? If yes, today’s Pandahall tutorial on how to make pearl beads pendant necklace for wedding is a wonderful choice for you! 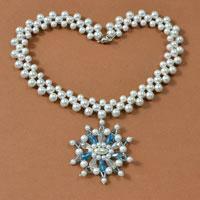 This is a detailed tutorial on making a blue and white snowflake large pendent necklace for wedding. 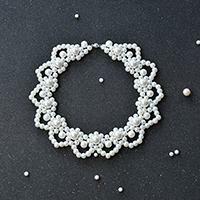 By following the steps below, you can also make this elegant and beautiful necklace piece. 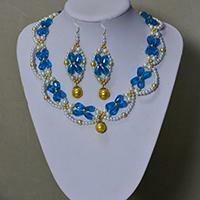 This is a video tutorial on making a blue and white glass and pearl beaded bridal necklace and earrings set. Go to the jewelry making video reference if you wanna learn more. 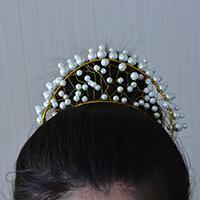 This Pandahall tutorial describes how to make a white pearl wedding crown headband. 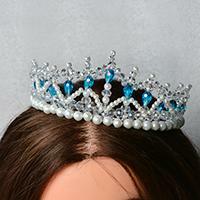 Hope you like this pearl crown headband and enjoy the DIY process. 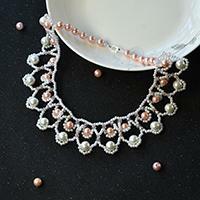 Today, I will tell you how to make a beaded cluster wedding necklace with pearl beads and glass beads. You will be surprised when you make it by yourself. 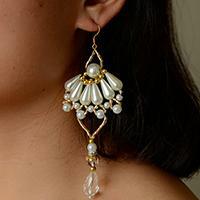 This is a bridal jewelry DIY project on making a pair of bridal pearl chandelier earrings. The detailed steps are listed below.